So many are hungry, and the conflict has caused a dramatic breakdown in health services. n 26 March 2015, the conflict in Yemen dramatically escalated. Two years later, it has become one of the worst humanitarian crises in the world. “We were already poor before the war,” said Amal*, 25, who was displaced from Taizz Governorate, “but now we do not have a house. Yemen already has one of the highest maternal death rates in the Arab region. But food scarcity is putting the lives of 352,000 pregnant women at risk, and it could harm the health of 2.2 million women of childbearing age who are in urgent need of assistance and protection, according to UNFPA calculations from January 2017. Some 52,800 pregnant women are at risk of life-threatening complications during childbirth. Meanwhile, the conflict has caused a dramatic breakdown in health services. An estimated 14.8 million people lack access to basic health care, including reproductive health care. Medical supplies are in chronically short supply. Only 45 per cent of health facilities are functioning, and only 35 per cent of these provide maternal and newborn services. 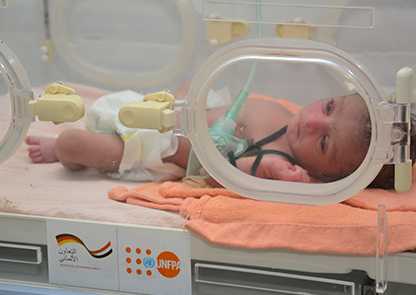 “One night, I was called to help a mother and baby who were dying after a home delivery,” said Safia*, a UNFPA-supported midwife in Lahj Governorate. “There was heavy bombing and a curfew from six in the evening to six in the morning. Today, an estimated 2.6 million women and girls are at risk of gender-based violence. Violence against women and girls has reportedly increased by over 63 per cent since the conflict escalated, with over 10,000 cases reported in 2016 alone. Seventeen-year-old Reham* is also shouldering the weight of her family’s care. “My dad used to beat my mum and my four siblings constantly, so my mum left us,” she said. “My dad also would leave us to look for jobs. As the eldest child, I had to take care of my siblings and the house. The United Nations Population Fund (UNFPA) is working to meet the urgent reproductive health and protection needs of women and girls. A version of this article appeared on the UNFPA website on 32 March 2017. Names have been changed by the authors, for privacy and safety.